US-backed Forces Respond To Statement Of Syrian President Describing Them As "Traitors"
US-backed Forces Respond To Statement Of Syrian President Describing Them As “Traitors” 3.3571428571429 out of 5 based on 14 ratings. 14 user reviews. It is not surprising that Bashar al-Assad considers the forces that contribute to the establishment of a social system based on justice and equality as treachery, since these forces emanate from the core of this experience and are institutionalized as a national army fighting terrorism and defeating it in all fields. A global conspiracy, it will certainly be considered all that emerged from this movement betrayal. We, Syrian Democratic Forces, and while reiterating that we continue without hesitation in pursuing terrorism, we believe that Bashar al-Assad and the rest of his regime are the last to speak about treason and its manifestations, since this regime is directly responsible. And this regime is to open the doors of the country wide in front of the hordes of foreign terrorism that came from all parts of the earth, and it is precisely who fired all the terrorists from his prisons to penetrate the blood of the Syrians in all their ramifications. just one big happy family! That’s not the statement of SDF. It’s the statement of the US department. Kurds are not Syrians. They must go back to Iran or Turkey. SDF is repressive. They don’t allow government parties to take part of elections. A tyrannic and terrorist group. They also expell oponents. Keep the Kurds landlocked and the oil spigot turned off until these paid mercenaries return to peaceful coexistence with the rest of Syrian society. Lol and somehow we got along fine with the terrorist. Really SDF ? Really Kurds ? Hell majority of them never been a Syrians in the first place. They are gypsies.. just like the Jews scattered everywhere.. and now Nomads too like to stay put on people’s land shamelessly claims it’s their..! Their fate will be like barzani..! Assad must reverse the situation. He must say that SDF is taking hostages by USA that make their statements. Then, he must say that SDF is repressive and they supposed to want elections but it’s not the case because they don’t allow governement parties. Then, he must say that they were betting on terrorism sponsored by their matsters americans who create ISIS to grab lands. Remember that everything USA blame on others they do it. So, it’s pretty easy. Just take their statements and reverse it to them. And you have the truth. In that case, “turned the table on those who were betting on terrorism” is an inverse accusation. SDF was betting on terrorism. Without terrorism, no SDF. “which is still betting on sectarian and ethnic strife and treanching”. Again, inverse accusation. SDF is kurdish. FSA is sunni. So oppostion are betting on sectarian and ethnic strife and treanching. America funds a loose coalition of anti-Assad forces, except the leaders of these people are more PRO-themselves than anti-assad. Each of these ‘opposition’ leaders are offered generational riches by France, the UK and USA. Extended members of their families can come and live well in the West, with their kids given places at the best universities. 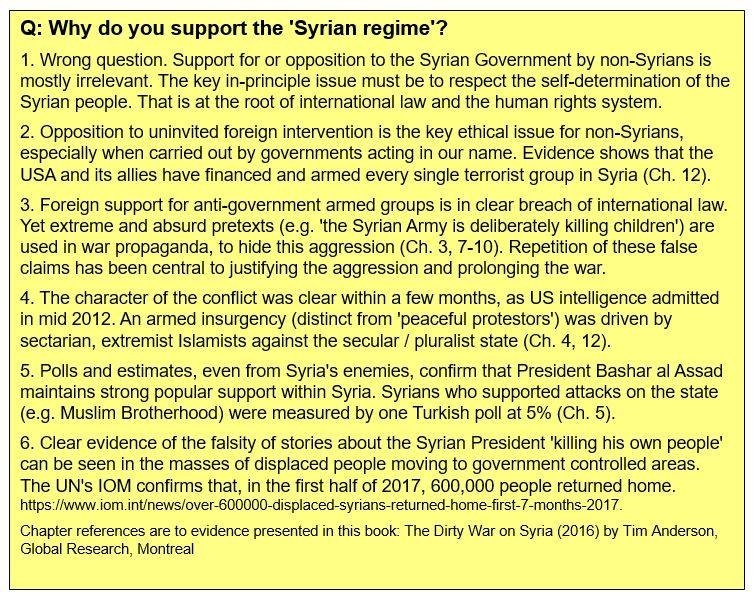 Putin won’t rush to defeat these people because he calculates there is so much anti-assad feelings in the region carefully crafted by embedded British agents on the ground. But Putin makes a MASSIVE mistake allowing the Americans to continue to exploit the situation. While American money stabilises a region the Assad government would currently find difficult to control well, America, Britain and France are able to prepare for the next round of major terror in Syria. Putin, in his ‘muscular vicar’ guise, always chooses the wrong path. Sometimes you have to grasp the nettle. Syria must be WHOLE, even if that means a period of an ‘iron fist’ in areas that think traitorous behaviour is acceptable. Once the leaders of the traitors have been identified and eliminated, even those regions will return to happy coexistence with the rest of the nation. Pussin is playing with Americans. he had enormous letal cards that he never played. President Putin has served the Syrian and Russian citizens well but most importantly beyond your observations a multi polar world through many trade and military associations (win-win to all involved) to include China and the One Belt, One Road alliances. You chose the wrong words or rather lack of understanding in these matters. The Art of War you should leave to the masters. However maybe if you read Sun Tzu’s “Art of War” you may understand more but frankly you are out of your league. I think he is right about Putin miscalculating his ability to play games with the devil. Boris, President Putin does not rush in, he has shown that since Yugoslavia, the funding of terrorist in the Caucasus, Afghanistan, Iraq, Libya, Syria and other mischievous destructive actions around the world it became very apparent that Atlanticism is the common enemy. No need to be dragged into a panic as there is a way to not only endure these attempts of Empire (unilateral) but by chewing gum and walking at the same time he has put together a global multi lateral (win-win) economic and military alliance/s that is the modus operandi to tame the dragon. You have seen a Saint George’s Medal, if not the only Patron Saint of Russia he is the dragon slayer. The dragon does not have to believe, to be slain. Citing diplomatic sources in Ankara ­– Russia helped prevent a successful military coup d’état in Turkey by intercepting encrypted messages and warning President Erdogan of the incoming attack on his government just hours before the rebel operation got underway. Intelligence about the planned coup was gathered by the Russian military units in the region. It is believed that officers at the Russian Hmeimim Air Base in northern Syria, which houses modern intercept systems, were able to capture and analyze encrypted radio messages, revealing the plans of the Turkish military to topple the government and capture or kill President Erdogan. The heads up from Russia gave the Turkish leader just enough time to prepare and adequately respond, evacuating his hotel at the Marmaris resort right before several military helicopters arrived at the scene to capture or assassinate him. I think you have it about right about the “Battle of Sinners and Saints, Boris. “he has shown that since Yugoslavia”. He and Lavrov sent Slobodan Milosevic to Kangaroo court in Hague for defending his country from US NATO aggression in 1999. “new Eurasian empire” it’s not gonna happen. There will be no Heaven on Earth until the end as it has never been. It seems like every generation dreams the same dream that has never happen. You buy the Yankistni narrative of anti -Assad sentiment widespread, that is among the terrorists, not the Syrian people, they revere their young secular President. “continue without hesitation in pursuing terrorism”. You can’t pursue terrorism with USA that created and financed ISIS, Ben Laden, Al qaeda, …..
A traitors death is all that can possibly await the terrorist-Kurd’s. Syria does not have the means to counter the Coalition air-power that is propping up the Kurds. The Syrian leadership’s only hope for any advantages over the status quo would demand that Russia cooperate more by sending enough aircraft to counter the Coalition. This would seem unlikely, inasmuch as NATO pressure demands large numbers of RuAF in w. Russia. Turkey will never allow a Syrian Kurdistan as it would be receipy for merger with Iraq Kurdistan. So Kurds’ survival will have to be with Assad . Assad should publicly Challenge the Kurds where they stand… with a hostile foreign power or with Syrians. The vast majority of SDF held areas have Arab majorities who are unlikely to support the Kurds Israelistan project east of the river. Especially once the Syrian government coalition makes more progress clearing the filthy Jew world order terrorists west of the river. And can devote more resources to shutting down the Kurd’s secession attempt. Assad had at last spoken as leader of Syria. Just read the SDF’s text. Totally irrelevant as to Assad’s definition of ‘traitors’. Assad was talking about siding with foreign forces in Syria to hurt Syria not those nonsense about past . Assad helped kurdish in Afrin vs Al qaeda in the beginning of the war…also helped kurdish in Aleppo and Hasaka…and now Kurdish appreciate the aid stealing the oil fields of Deir Ezzor in coperation with US forces known for their links with wahabi terrorist in Syria! And he would have helped them in other places if they weren’t trying to keep the SAA out of those areas. Why helping them ???? Let them die. USA SDF are terrorist and land oil grabbers.Their are equal to YPG.USA is a mother of all terrorist guys and lesbians wants to great terrorism in North Korea.SDF is not legitimate government forces.Remaining ISIS have been converted into SDF and are base with Bagdadi in Al Tanf USA base. This was exactly what Assad could have expected. He was giving the US the perfect excuse to stay to protect the Kurds against “dictator” Assad just as it once protected the Iraqi Kurds against “dictator” Saddam. Assad needs to take a hard line on the Kurds in order to maintain the confidence of the armed forces, but he does not have the means to counter the Coalition air power that is propping up the Kurds. The SDF needs to be careful. They don’t need Assad against them as well as the Turks. Their American friends have more ‘interests’ in Iraq where they’re ‘invited’ than getting to a boondoggle in Syria where they’re invaders. The SDF in Syria is no more ensured of U.S. support than the Kurds in Iraq were. They really depend on good relations with Syria (i.e. The SAA and the Syrian government. These Syrian Kurds sadly need a lesson like the Iraqi Kurds. They really think that the US is there to protect them. Classic case of being used and then abused. The SAA fight terrorism and the SDF goes for the oil fields , what a charade. Working with US is treacherous as they supplied and manged ISIS. The propaganda of women in uniform is all part of the show. The SAA and their allies are the Hero’s and patriots here. Let us face reality, indeed before Assad became Leader his father and cronies did indeed, not so much oppress the areas of heavy Kurd polulation, but more on order of “Benign Neglect”. There was a populace uprising with support by many diffehhen re corrupt population,rvent Syrian groups. Assad was modernizing the nation and had a far better and younger more progressive advisory group than Syrian power groups had never seen before, and their programs were succeeding, but too little and too late. This is when those of US and Euro natoons stepped in and took advantage off situation, funding Kurds who history proves is that they never liked any but zkurds, and even they split. Before Assad most all politics and money flow was in and toDamascus, it was bleeding rest of nation, and it’s VERY CORRUPT PEOPLE’S AND INSTITUTION lived in economic levels far higher than outside its population outside of its municipal limits. Even Assad and his progressive advisors could not break, and still have not to this day, the “Repressive and yes damn regressive tribal government leaders of huge local land mass control. There was no Syrian people’s cohesiveness, one reason Syrian troops threw away arms and in many cases joined ISIL and AL’Q, they also made more $’s. Kurds are Kurds and loyal only to Kurds.and US/NATO/Israel know it,. Syrian troops did not throw away their weapons like pussies, and NEVER joined terrorists for money, you obviously don’t know Syrians, The just had to fortify Damascus at all costs while their logistics supply routes were being bombed by the US coalition. At beginning IZIS had but small lightly armed mlitas who did indeed scare the hell out MAINLINE Syrian troops. Abandonment of weaponry, even tanks and A P C were abandoned., some in mass unitNext most of the troop went of three places, Europe, lebanon, Jordan, and the almost 80% (millions) of Syrian fighting age males ran as well. AtUS did aid Initually with air power it was nowhere near INTENSITY of today. Most smaller Syrian towns surrendered without a shot by them fired. NOtice what has happened just in last year to city buildings and infrastructure, darn near all flat as a pancake done by loyal Syrian forces. Before Russia halted the total collapse no cities were getting flattened because the rebels had no resistance..
What fairy tale did you read that you just posted about? Nothing you posted had any resemblance to the western Zionist attack on Syria or the civil life in Syria. Syrian forces flattened their own cities? I suppose the US air campaign was just a bit of tiptoeing through the Tulips. I’ll say one thing for you…you’ve got gall…or is that hutzpah? Written by someone at the Pentagon. What tyranny? US tyranny with the aid of the Kurds is a more accurate explanation. Kurds siding with the enemy, US are traitors and traitors are put to death, simple as that. Syria’s privileged Alawaite elite rose to power during French rule. While I do not sympathize with this aspect of the power structure in Syria, but they have been intransigent defenders of Arab dignity and rights versus zionist and imperialist aggession. There are some very old Kurdish communities in Syria, but many others arrived there as refugees from Turkey. Most who arrived as refugees have never been granted citizenship..
Kurds only make up 6% of the population in Syria. They are a minority in most communities presently under YPG occupation. a traitor, I would say that they are more an invasive or separtist power than traitors. They are not trying to improve the old Syrian Sovereign nation or its peoples as a whole, and are but a acting solely in own interest. When ever have Kurds claimed to be anything but fracturous Kurds. As Syrians, I say never. It is very obvious that no matter the lands they live within they try to be seperate, IRAq. Now Syria, they want to divorce themselves from any and all non Kurd states. As such they should be utterly crushed, or like Isel and especially Kosovo, given some fictitious excuse for own Nation. As ‘democratic forces’ as all other terrorists Syria is fighting against. Nothing good comes from those American criminals are suporting.